Aruba, dubbed as One Happy Island is exactly that. This Caribbean island is below the hurricane belt so you can enjoy it year round without fear of a natural disaster. 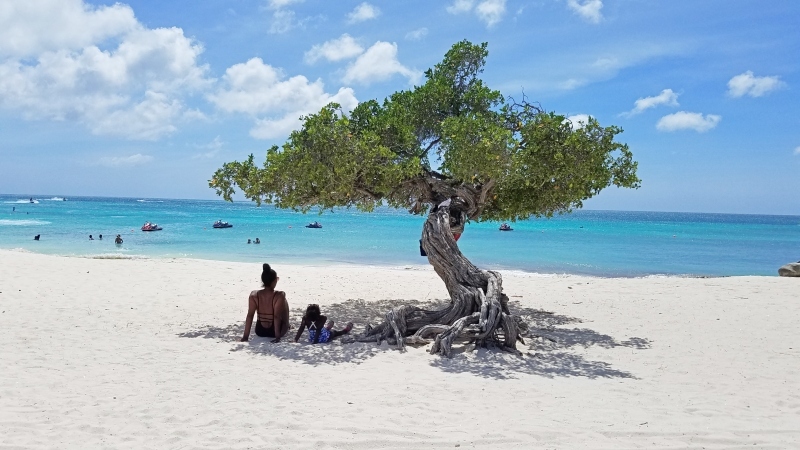 Here are some things to do in Aruba with kids that adults alone would enjoy to help you plan a trip to Aruba. If you’re looking to cheap flights to Aruba, Skyscanner will help you. Skyscanner is how we found our cheap flight to Aruba on a holiday weekend. In my case I wanted to take advantage of 4th of July and have a 4 day weekend with only having to take 1 day off work as the holiday was on a Tuesday. Taking advantage of paid holiday’s is how I travel frequently with a full time job. For this trip I actually didn’t care where we went as long as it was affordable and that’s why I used Skyscanner. It allows you to find cheap flights two ways. 1. If you have specific dates but don’t care about the destination you can search your home (and nearby) airports and select the destination as everywhere. Just enter your dates and Skyscanner will tell you the cheapest places to fly to during those dates. 2. 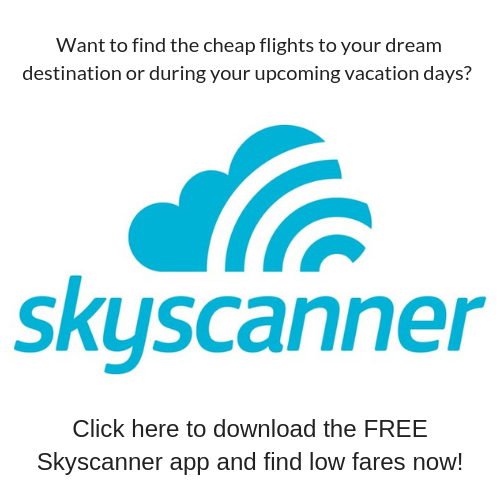 If you have a specific destination you want to visit but are flexible with dates you can search the cheapest month to travel to that destination and Skyscanner will do all the work for you. Their app is just a great as their website, download it here. 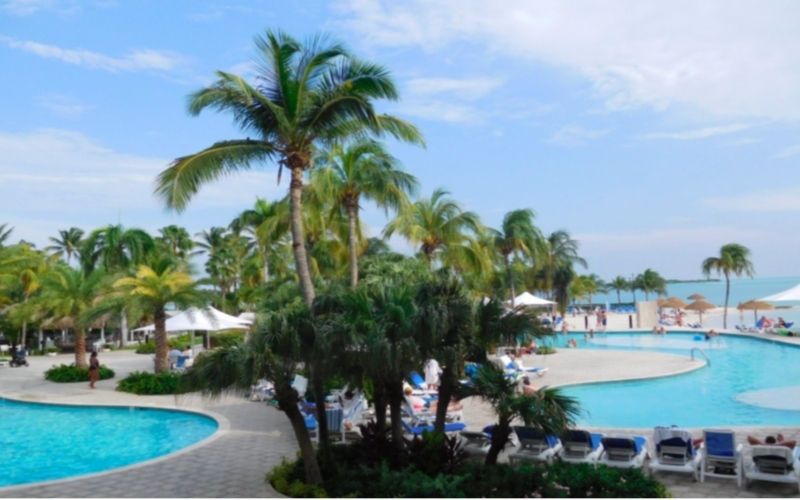 We chose to stay at the Renaissance Aruba Resort and Casino. 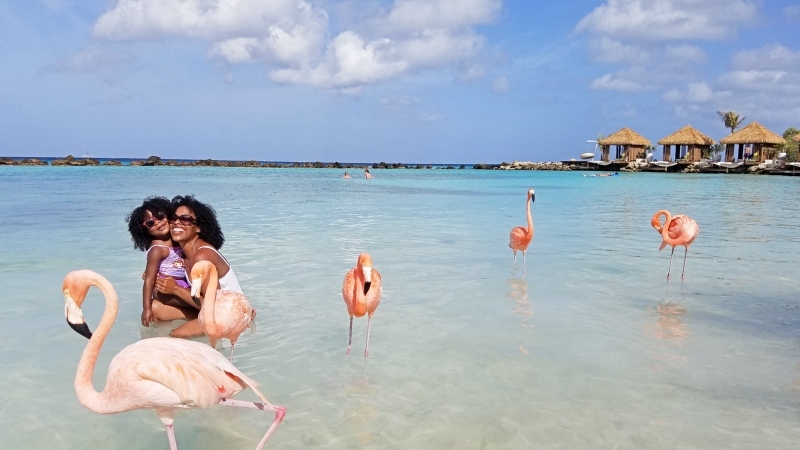 Our main reason for this decisions was to have access to Aruba’s Flamingo Beach on the hotels private island. It’s where you see all of the infamous photos of people feeding flamingos in Aruba. If you don’t stay here but want to visit Aruba’s Flamingo Beach you will have to pay $100 per person for a day pass. If you’re going with your child, kids are only allowed on the beach with the flamingos from 9-10AM as it’s on the adult only side of the island. The price of the hotel was the same and in some cases cheaper than the other options nearby making more sense to just stay there. Renaissance Aruba Resort is in a great location; there are shops, restaurants, and a movie theater in the outdoor mall attached to the hotel. It is also directly across the street from the I Love Aruba sign. It’s ten minutes from the airport and the taxi will cost $18. Be aware that if you fly in on a Sunday their is a surcharge for taxis and the price will be $21. We got to Aruba mid-day but our room wasn’t ready when we arrived at the hotel. We grabbed lunch and then hung out at the pool. Before dinner we walked around our hotel area a bit and came across the cutest little house. 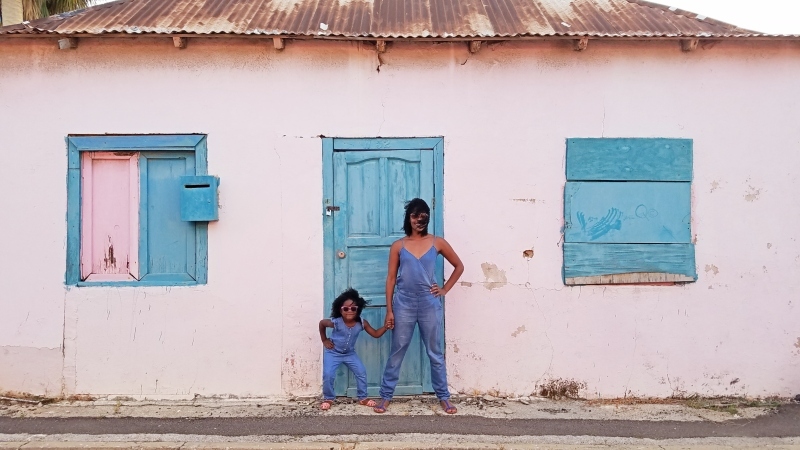 There are tons of bright colored buildings in Aruba and this one was too cute not to snap some pictures in front of. Looking for the best restaurants in Aruba? We loved the Sea Salt Grill so much we ate their twice. They have live music at night, the food was really good and prices were reasonable. 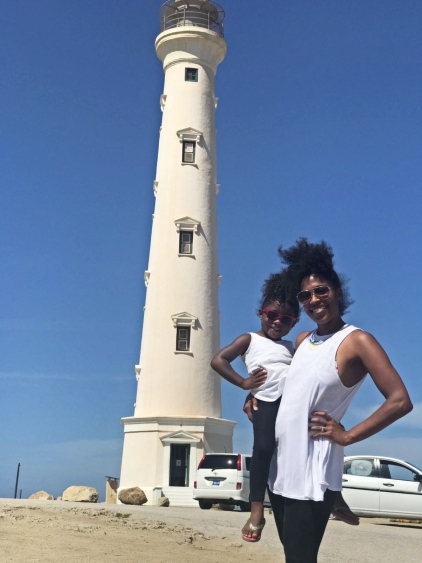 As beautiful as the beaches in Aruba there are more things to do in Aruba with kids like exploring the National Park. We booked this half day 4×4 tour through Viator. After booking, a follower who saw we were in Aruba said visiting the California Lighthouse was a must. When we met our tour guide I asked him if this was something we would see and he said it wasn’t apart of our tour. I let him know I was disappointed as it was recommended and he said not to worry he would make it happen. He did, along with some other surprises. I was so appreciative of this and it really made a difference. Our tour guide was Andrew if you want to request him! 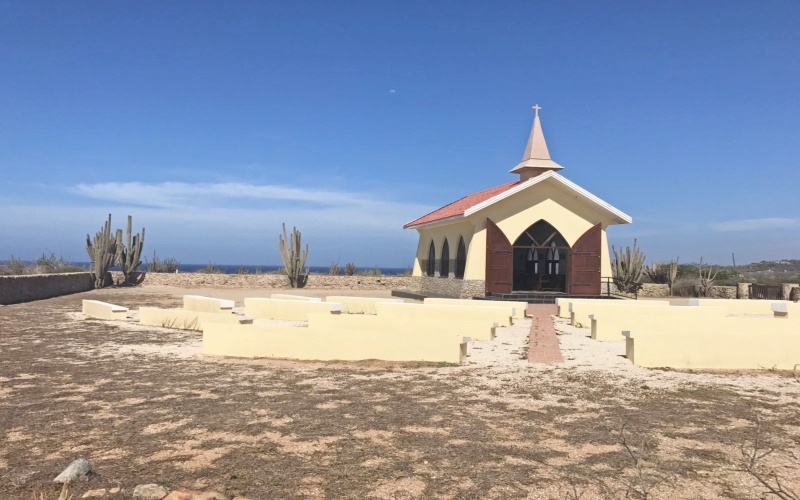 ​After a quick visit to the California Lighthouse, Andrew made a second bonus stop to visit the oldest Catholic Church on the island, which is in the middle of nowhere. They still have mass every Tuesday and some people get married here. Our final stop and the main attraction was the Natural Pool Aruba which is right along the coastline. 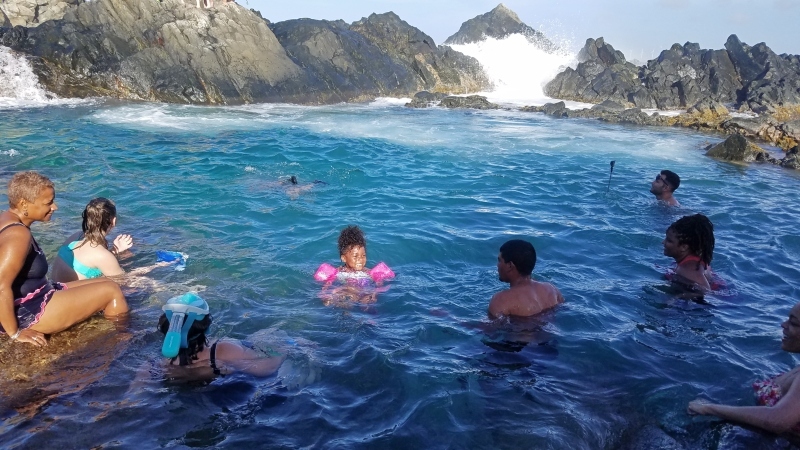 Here we spent an hour and you can swim, snorkel, or jump off the small 3ft cliff. Palm Beach and Eagle Beach are rated as two of the Best Beaches in Aruba and we’d be exploring both in one day. 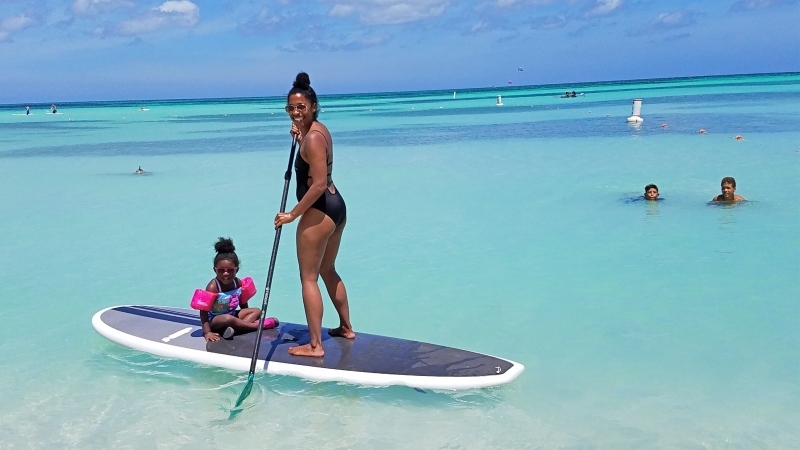 The water at Palm Beach Aruba is calm and shallow making it a great beach for families. If you want to do sports activities Palm Beach Aruba is the best beach in Aruba for this. Activities on Palm Beach included kite-surfing, jet-skiing wind-surfing, parasailing, SUPS, kayaking and much more. We decided to rent some SUPs from Island Cabana. Island Cabana also rents clear kayaks which is great for seeing the crystal blue see-through water while paddling. They are two-seaters but if you have a small child they are allowed to sit in front of you even if there are two adults. They do not provide child life vests so be sure to bring your own. Next we headed to Eagle Beach, famous for the pair of native Divi-Divi Trees. ​While there are water sports/activities available here there were definitely more options at Palm Beach. The water at Palm Beach is also a lot more calm and see-through. Whereas at Palm Beach Jordyn and I could go far out, we couldn’t go more than 5ft from the shoreline at Eagle Beach. Renaissance Island which is where Aruba’s Flamingo Beach is located. It is open from 7:00AM-6:45PM. Boats pick up guests every 15 minutes from the dock. Although we visited Flamingo Beach each morning from 9-10AM to see the flamingos before going off to explore the rest of Aruba, today we stayed for half the day. After our hour with the flamingos we moved to the family side of the island. It is just as gorgeous and honestly better for swimming. This is because everyone isn’t chasing the flamingos around trying to get a picture. On the island you can rent kayaks, paddle boards, and go on diving trips outside of the enclosed area. There is a restaurant and two bars. 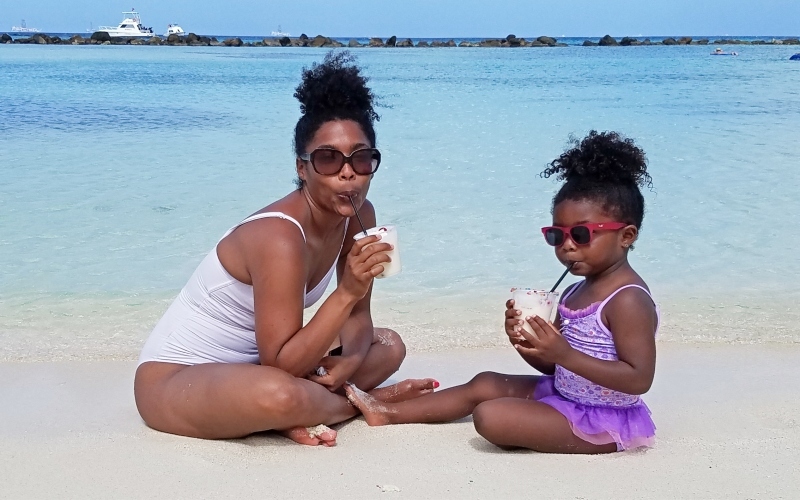 Enjoying Pina Coladas on the family side of the private Renaissance Island. Like the Bahamas you clear U.S. customs prior to boarding your flight. When you arrive at your home airport you will arrive at a domestic terminal and be able to leave the airport immediately. Due to this arrive to the airport a little earlier than you might in case there are long lines. If you end up having time to kill before your flight departs and are a Priority Pass member you’ll have two lounges to hang out in. U.S. dollars are widely accepted in Aruba so there is no need to exchange cash. While Visa and Mastercard are also widely accepted we saw quite a few places that do not accept American Express. Carrier: Aruba is hot and it’s very easy to use a stroller here so I would caution using a carrier as you and baby will most likely be sweating a lot. Carseats: If you will be renting a car I would bring your own car seat. Some of the taxis we got in had missing seat belts in one or all of the seats in the back. You won’t be able to use a carseat on the off-road tour. We had a great time exploring Aruba. 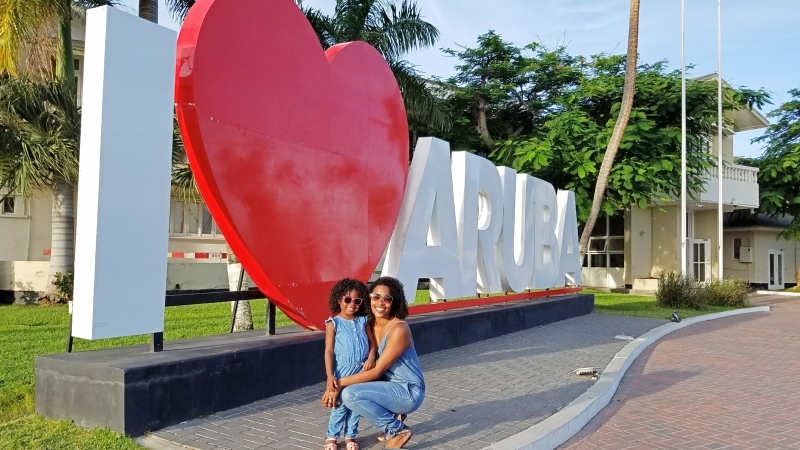 There are many things to do in Aruba with kids, I hope this helped you plan a trip to Aruba. If you found it helpful please share this article! 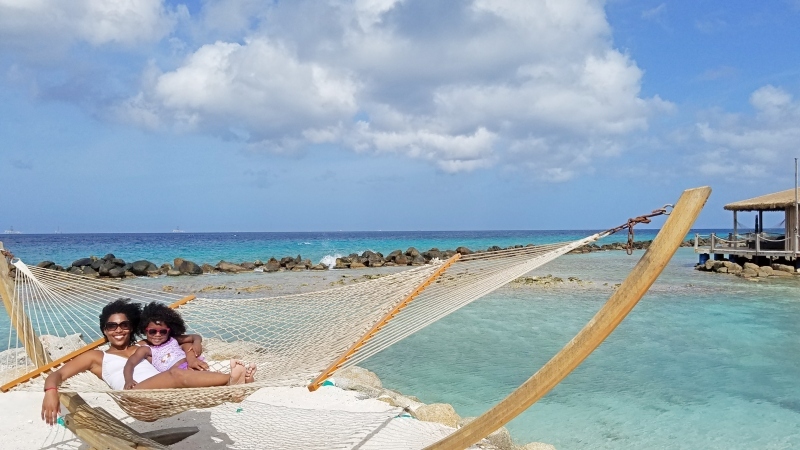 How did you book your trip to Aruba? Did you do the all inclusive option at the resort? I booked everything direct myself, I never use travel agents or purchase vacation packages. I did not do the all inclusive option at the resort, the plaza connected to the hotel had plenty of dining options. Hi, your trip looks amazing!! 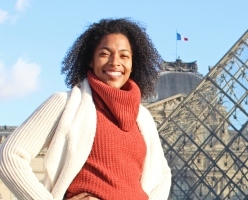 How did you budget for your trip? On average how much did it cost total? If you could please break down the hotel & flight cost. I was going to ask the same question! Also, what time of year did u go? We went in July and went Saturday- Tuesday. Thank you, we had a really great time. 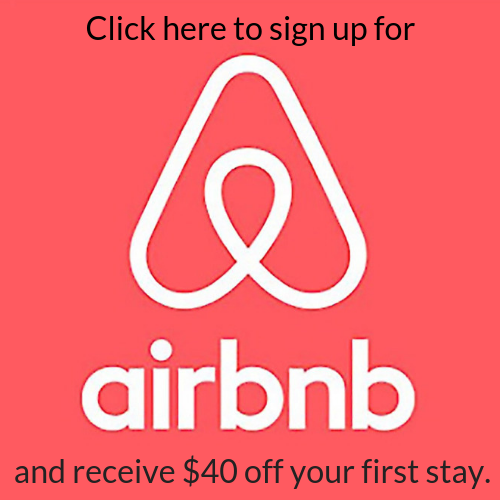 I would recommend going on the hotel’s website to price it out, their prices vary depending on when you go and any potential promotions they might have. The same is true for airfare and it all depends on where you are flying from, we live in South Florida so fly from Miami or Ft. Lauderdale. We paid $150 each for our one way tickets to Aruba and I used points for our flights back so those were free. The hotel was $169/night and I split it with my friend who came with us. The tour was $150 for both of us and included lunch. Taxis to and from the airport were $18. The water activities were $25/hr. Meals ranged from $5 (Jordyn wanted Dunkin Donuts for breakfast lol) to $25. Taxis to the other beaches were around $20 I believe so all in all I spent about $800 for the 4 day trip. Thanks so much for the details! We’re planning to go in December! Do I need a Visa to visit Aruba 🇦🇼??? I don’t know where you live or the country’s passport you hold to give you a 100% answer on if you will require a visa. As someone holding a US passport we did not need a visa. I would recommending checking online if you need one from where you live. How long have you been traveling with your daughter? My husband and I traveled to Disney World with our 4 month old in December. In may we are traveling to Aruba and he will be 9 months old. We are going to the Soul Fest so we have to take turns hanging at the day beach parties. Most likely I’ll hang pool side with the baby at our hotel & let hubby enjoy since I’ve been in the past. How long did you let your daughter spend outside (pool/beach) since its sooo hot. I don’t mind the heat but I know his skin is sensitive? I can’t wait to explore other destinations as he grows up. – The Flamingo Float you were on, is that a rental a purchase or included as an option in your stay ( I saw a package that included that, photos at the beach, and drinks upon arrival)? It was on the beach one of the days we were there and I’m honestly not sure if it was the hotels or a guests but pretty much everyone on the beach was using it for pictures lol. Sorry I’m not much help here. I really enjoyed reading everything you’ve experienced in Aruba. 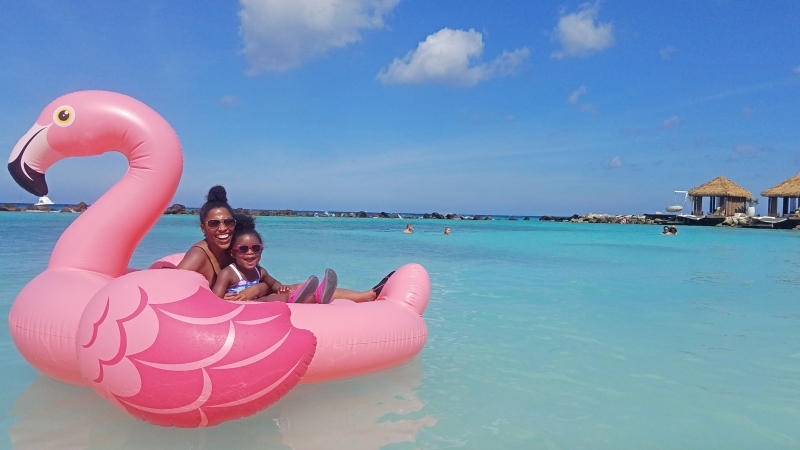 My family and I are planning a trip to Aruba and we definitely want to go to the Flamingo Beach. I was thinking about staying at the Renaissance Hotel too but I was reading that this hotel is for adults only. My brother is 12 years old and I don’t know if he would be able to stay in the hotel. OMG, I am sooooo sorry I am just seeing this Veronica. Yes, he can stay, Jordyn and I stayed there and she was 3. They have two buildings, one is adults only and one is for families or anyone. Can I have andrew’s contact information? Sorry I don’t have his direct contact information, we booked the tour through Viator (I linked the exact tour). Maybe you can call the tour company to get his info. Thank you for this info. I’m planning to take my 12 yr old for my birthday at the end of August. I’m planning to get all Inclusive only because my son is such a picky eater. How does it work with taking the kids on the adult side, do they kick you out?